Inbound combines refined mineral oil with a high concentration of non ionic surfactants. Inbound Spray Adjuvant is a unique blend of highly refined mineral oil and non-ionic surfactants which is designed for tank mixing with certain agricultural products. The high loading of non-ionic surfactants (greater than 20%) will improve retention, spreading and penetration of active ingredients thereby increasing their efficacy. The mineral oil utilised in the Inbound formulation has been selected to minimise the risk of phytotoxicity on crops and pastures. Inbound Spray Adjuvant can be easily mixed to form a stable emulsion in a variety of spray water qualities that are used for agricultural spraying. 1. Reduced losses of the active ingredient (a.i.) - Mineral oil acts as a carrier which can help minimise a.i. loss due to spray drift and evaporation. On contact with the target, the non-ionic surfactant can reduce the incidence of droplet rebound while the oil reduces the potential for run-off. 2. Improved performance of the active ingredient – Non-ionic surfactants spread the spray droplets across a greater surface area therefore creating greater opportunity for the a.i. to penetrate the target. Mineral oil and surfactants will also modify waxy barriers on the surface of the target which will help to increase a.i. penetration. 3. Less potential for spray blockages – As Inbound contains more than 20% non-ionic surfactants it can reduce the likelihood of nozzle blockages, especially with hard to disperse WG’s and DF’s. Always follow the directions for use on product labels. The active ingredient’s label has precedence over the adjuvant label. 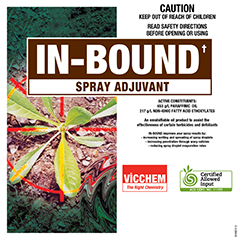 Inbound Spray Adjuvant is suitable for use with a range of products where mineral oil based adjuvants is specified on their label. Agitation of the spray tank should continue until completion of spraying. Premium formulation utilises highly refined mineral oil with lowphytotoxicity potential and a high loading of non-ionic surfactant for excellent mixing in a variety of spray water qualities. 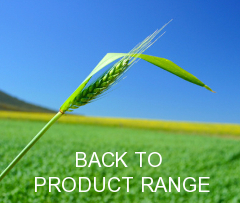 Field trials conducted with Inbound Spray Adjuvant have shown its suitability with a range of products. Inbound Spray Adjuvant can be used with products that recommend mineral oil adjuvants and is particularly well suited where an adjuvant with a high loading of non-ionic surfactants (>20%) is recommended. In cases where the active chemical’s label recommends a specific adjuvant, it is best to use the product specified.